Note: these identification tips apply to both sexes. Male depicted here. distribution Statewide; presumably occurs in all 100 counties. A few coastal counties lack a record, and probably absent on the Outer Banks. abundance Fairly common to common essentially statewide, seemingly somewhat more numerous in the Piedmont than in the mountains or Coastal Plain. Rare toward the coast, and likely absent on the Outer Banks. Does not occur in swarms like a few other baskettails (Common and Mantled). flight A long flight period compared with other baskettails, and the only baskettail species that extends through the summer into early autumn. In the Coastal Plain, the flight occurs from late April to late September; in the Piedmont, from early May to mid-October (though scarce after August); and in the mountains, from late May to mid-September. habitat Slow-moving waters of lakes and ponds, or still rivers. Usually in open, sunny places. behavior Males are often seen making long back-and-forth flights along canals, pond and lake shores, etc., in sunny areas well away from forests. Unlike the other baskettails, this species only infrequently perches. 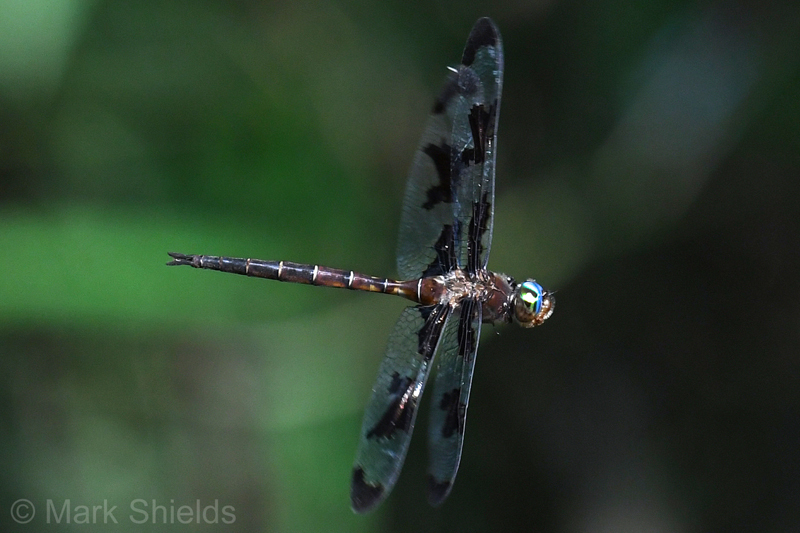 comments It is surprising that this species is included with the other four NC baskettails in the same genus (Epitheca), as the Prince Baskettail looks and behaves more like a species of darner or skimmer than a typical baskettail. The wings are boldly blotched in black, and the adults glide and fly in a choppy manner, with wings often held above the horizontal, for long periods of time. As they only infrequently perch, one normally makes the identification (easily) in flight. Comment: Jackson, 2018-06-25, Lake Glenville at Powerhouse Access Area - First record for county.